I am still figuring out my Thai vocabulary. So far, it has been limited to 4 words – Gai, Moo, Goong and Nam. And I have been practicing ordering in Thai and have little results to show – so for the time being, only Pad Thai, Rad Na, Tom Yam Goong, Som Tam will be served. Until a local fried came to the rescue. Kup Phun Krup. This is the first time for a long time since I divert from the safety of my hotel and adventure into the belly land of authentic Thai cuisine. And first stop – Ihsan food. 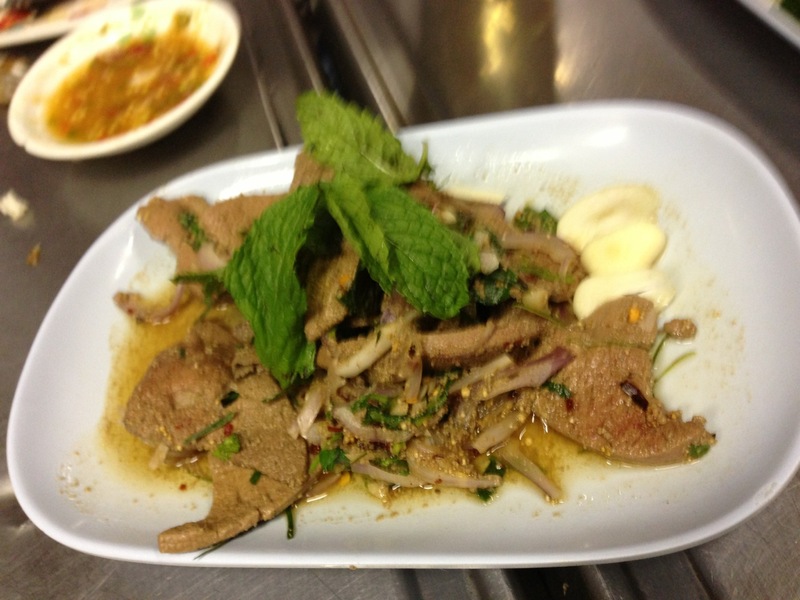 If you like Thai food, you will find that Ihsan represents one of the best regions for good Thai food. 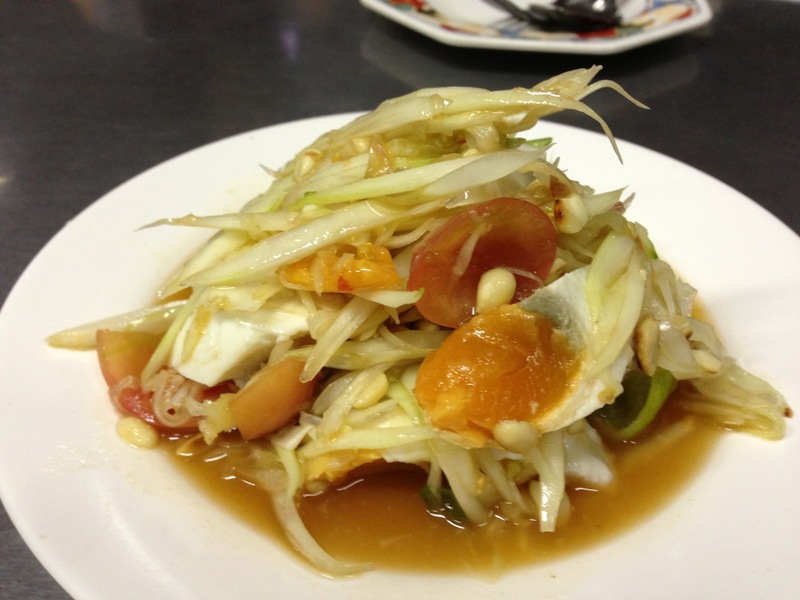 First dish, the favourite of Farangs like myself, a must order when you go to a Thai restaurant – Thai-style Green Papaya Salad. To make it really local, we added Salted Duck Eggs – yummy! 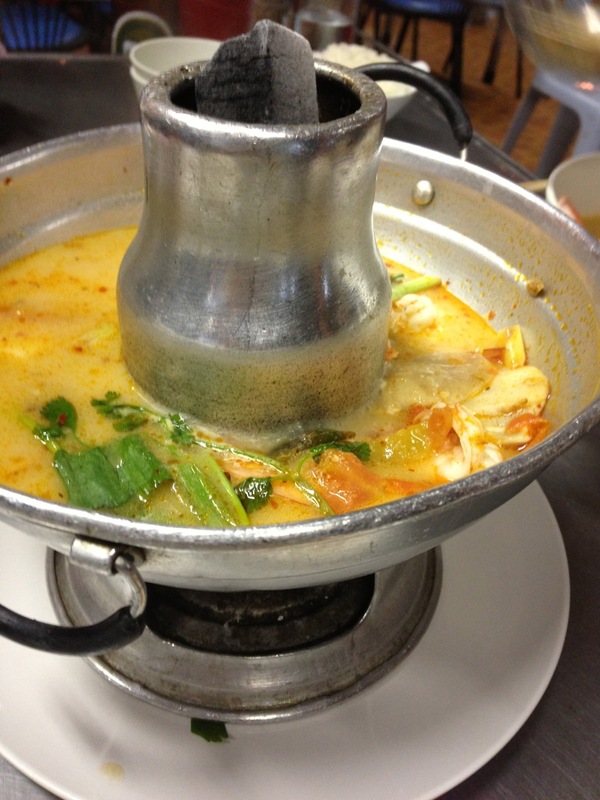 Next up the other must order Thai food – Tom Yam. For those uninitiated, Tom Yam ต้มยำ is the taste and you can add a variety of white meat or seafood. So you can add Chicken or Prawn or Fish or Squid, or a combination, you decide. And depending on your tolerance, you can adjust the heat. It comes either in a clear soup base (the local variety, if you have not had it before, you must try it) or a red soup based (the common overseas variety). The soup hits you with a sour, fragrant, flavourful, complex taste and if you have a Thai friend that has twisted sense of humour – fiery. The first mouthful – heaven, second – burning hell. Nevertheless the soup opened our appetite and we ate a lot more after this. Fried Morning Glory is everywhere in Thailand. 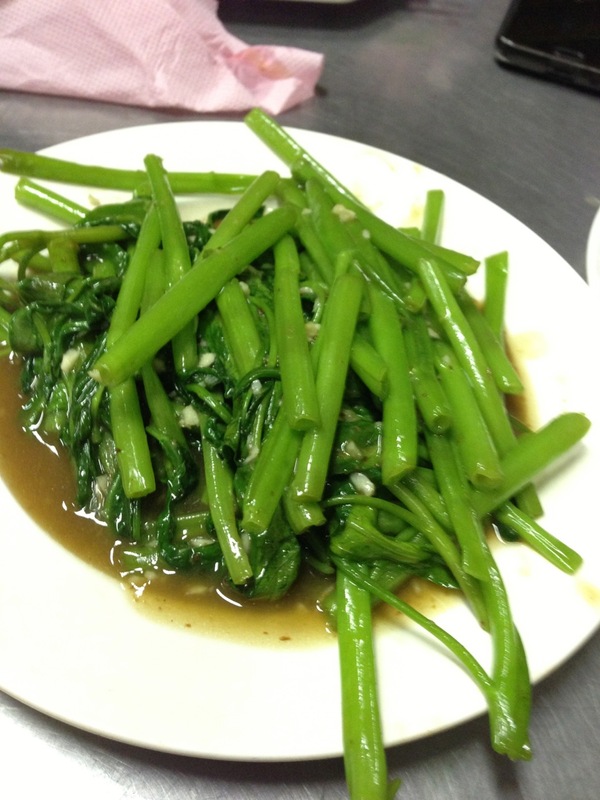 “Phak bung fai daeng” ผักบุ้งไฟแดง is a simple stir fry dish of water spinach (called kangkong in Singapore) with garlic, chilli and yellow bean sauce. 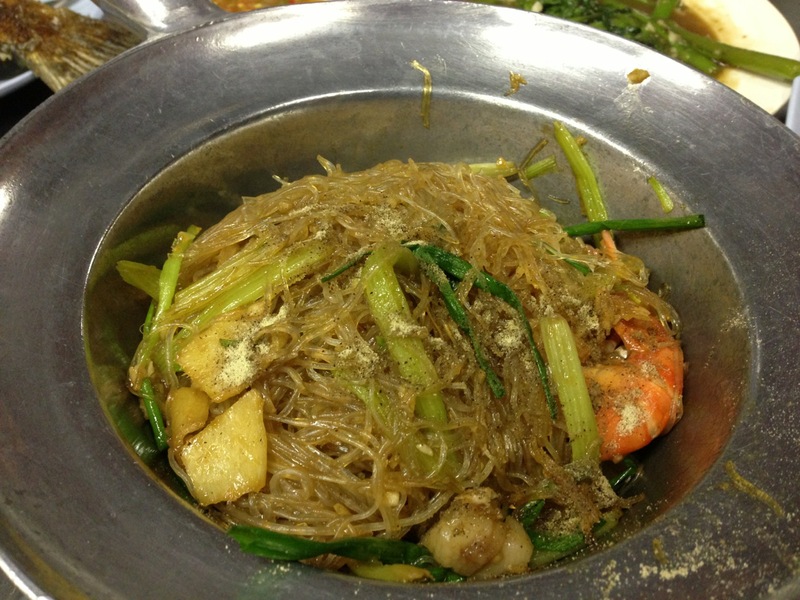 The version we have in Singapore is usually with sambal and balacang (fermented prawn paste). 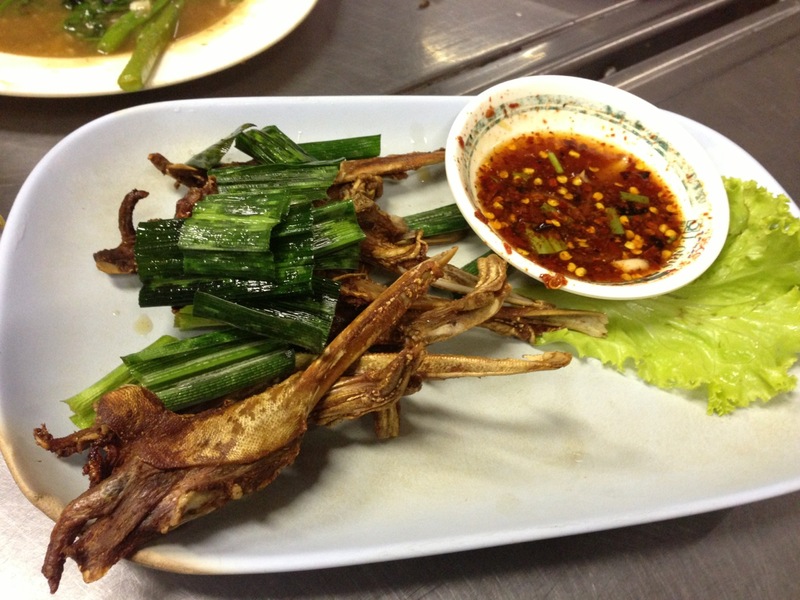 Deep Fried Duck Head (or Duck Beak, either way it does not sound savoury) or “Pak Bped Tord” is a perfect beer snack to start the meal. The little morsels of skin, flesh and brains on the duck head were well marinated. 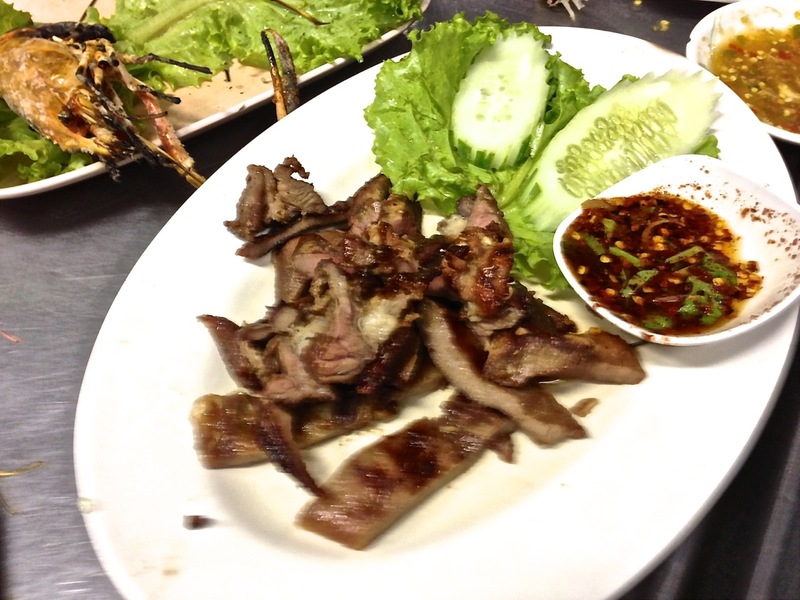 Eaten with the sweet chilli sauce that was given a kick by a dash of fish sauce, the duck beak was a real treat after you get over the mental fear that you may have. 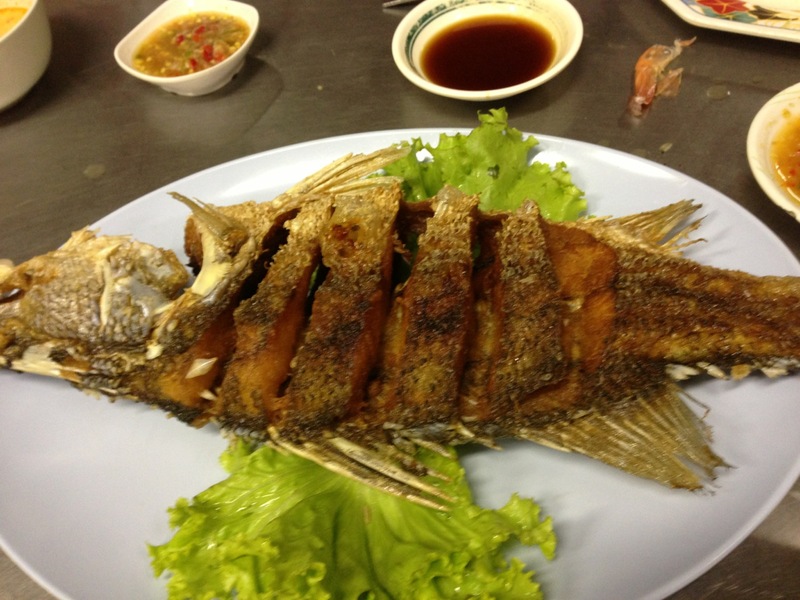 Deep Fried Fresh Water Fish or “Pla Thot” ปลาทอด can come in several variations, most common are Tilapia or Sea Bass. Served with sweet chilli sauce, the fish was well fried that got rid of all the earthy taste of the fish. Stir-fried Prawn with Vermicelli or “Woon-Sen Pad Khee-Mao Koong” was another earthy dish made up of fresh river prawns stir fried in ginger, garlic, spring onions and loaded with vermicelli and added pepper to taste. This is one of the rare Thai seafood dish that is not over-powering with lemongrass, lime or other sour element. The fiery pepper used did not cover the freshness of the prawn, and heat was up a notch with the liberal use of ginger. Shiok! This was a type of Ihsan sausage, usually served as a snack with glutinous rice, but we had this one with beer. 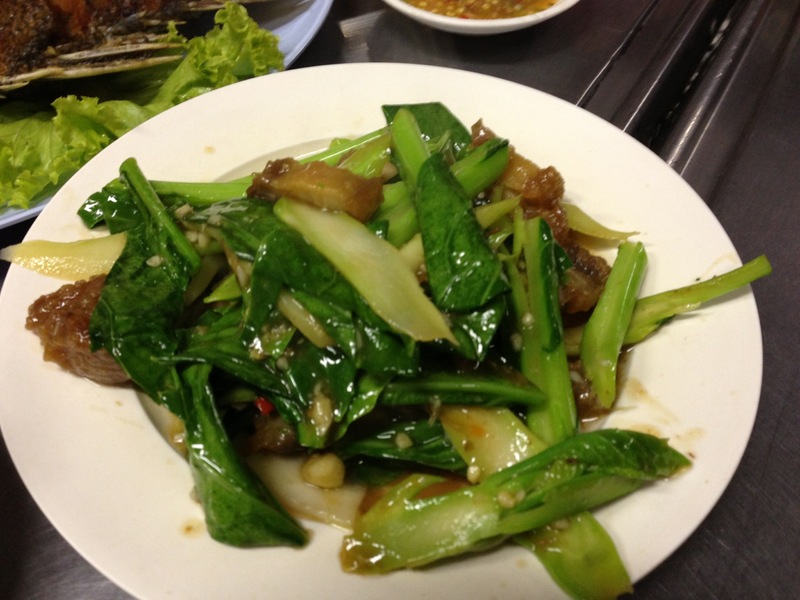 Stir-fried Kailan with Crispy Pork and Oyster Sauce or “Phat khana mu krop” ผัดคะน้าหมูกรอบ. 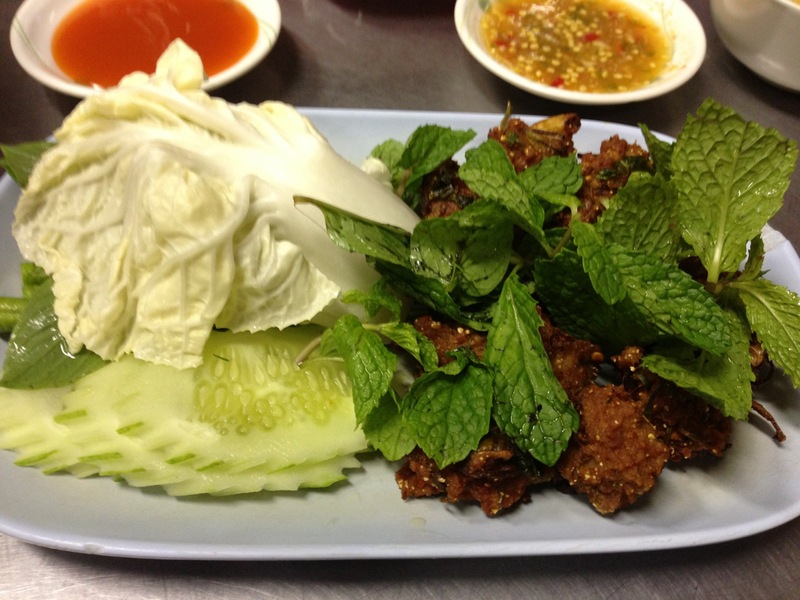 The pork belly is deep fried and then fried with the kailan to give it that extra crunch from the savoury meat. 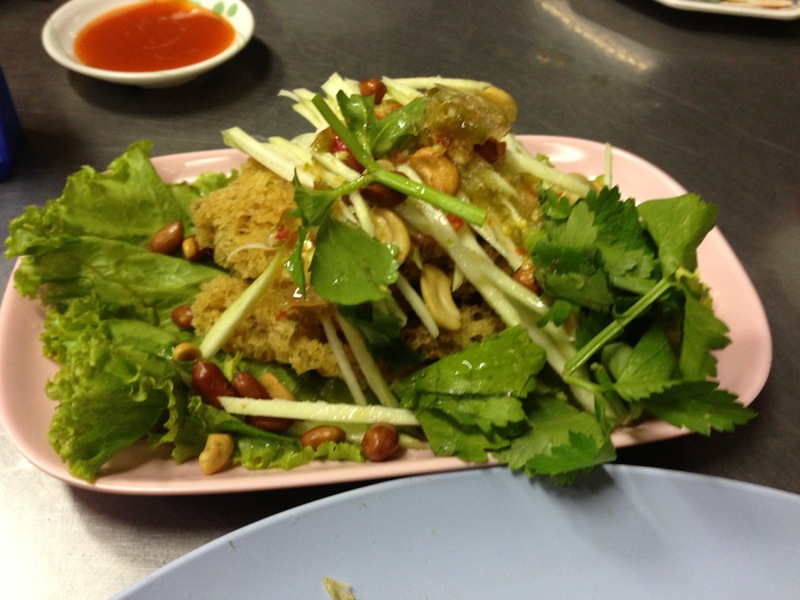 Deep fried minced catfish or “Yam pla duk fu” ยำปลาดุกฟู is a salad made with crispy fried shredded catfish served with a spicy and tangy green mango salad. I had a failed version in Makati, this was much better. Stir fried beef liver with shallots, sesame oil, and basil. Can’t find the thai name for this though. 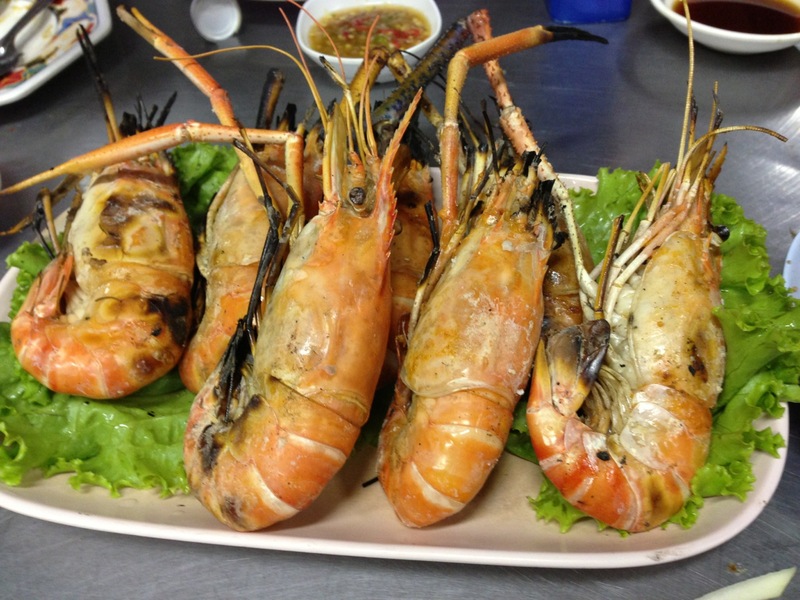 Grilled River Prawns or “Kung yang” or “Kung phao” กุ้งย่าง/กุ้งเผา served with a spicy namchim sauce, the greenish looking sauce at the top of the photo. This sauce was made up of raw garlic, green chilli padi, fish sauce and lime. The prawns were grilled without any embellishments that brought out the juiciness and sweetness of these prawns. 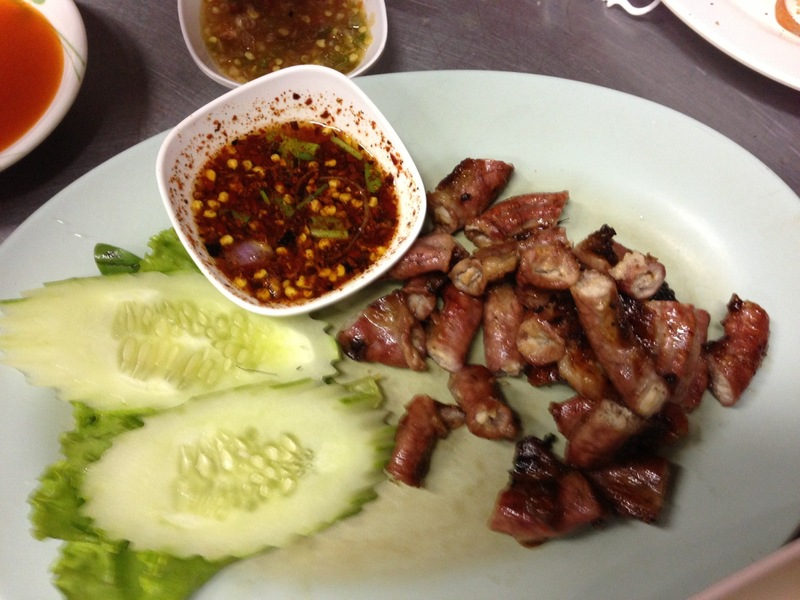 Deep Fried Pork Intestines or “Sai mu thot”. A bit chewy, quite disappointed. Pardon this really long post, I wanted to keep a very specific memory of a very good meal. Also a complete record so that I can repeat order when I am without a Thai speaking friend. Heck! I cannot even repeat the address of this place, but I shall prevail. Here’s a good reference for a Thai and English reference for common Thai dishes.